-Do your research. I always turn to Consumer Reports and Good Housekeeping and then go from there. I also like to compare prices online. 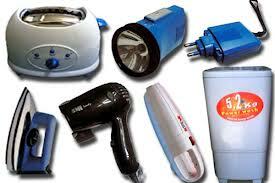 Make sure to include the shipping fee and haul away fee if it applies to your purchase.-Go for energy star appliances. These appliances will save you money in the long run by not wasting energy. -Consider last year’s model. Newer models are usually loaded with lots of features, but are expensive. As soon as they hit the store, the older models are reduced. Do your research and go with the best model from last year. -Floor models are an option. These usually have scratches or dents, but they work. Some stores also extend the same warranty for new appliances to floor models. -Check appliance outlets. Just make sure you know who you’re dealing with when making a purchase. Bargain Babe suggested sticking with manufacture outlets when buying major appliances at an outlet. -Craiglist and Freecycle are your friends. I mean, what’s better than scoring free or steeply discounted appliances?! -Warehouses are another possibility. Though their prices aren’t always competitive, and some don’t honor price matching, they do have some other nice features that can bring a price down -considerably (free shipping or delivery, are good). -Shop patiently. A while back, I shared it took me a whole day to shop around for my new range. I saved $174.80 on my range and got free shipping and haul away. I could have saved more money if I would have had more time to shop around. If it’s not an emergency, take your time to compares for new and used appliances. -Pay more for reliability and skip all other unnecessary features. Yup, you read that right. I just said to spend more on the most important feature. You see, in the end it will pay for itself when the appliance last ten or more years instead of one or two. Paying more now for an appliance that is reliable will save you more later. -Consider your layout. Big appliances that end up in the kitchen are usually the most expensive and eat up the most of your electricity. Placing your refrigerator next to your range is a bad idea. The heat of the range will make your frige work extra hard to stay cool. -Start a replacement fund. The sure fire way to spend more on appliances is to have them break down on you at the most inopportune time. Trust me, it’s not fun and quite stressful. I’m starting to set money aside to replace our fridge that’s more than 10 years old.